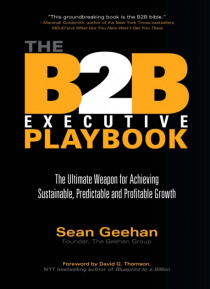 The first book completely focused on successfully running B2B, which is very different from B2C. The fate of a B2B lies in the hands of a few individuals so what ultimately determines if a company thrives, or even survives, is how these key relationships are targeted, structured and managed. Over 30 percent of all B2B product development, marketing, and other discretionary dollars are wasted. When… the realities of B2B marketplace are not integrated into a company's SOP, it is more likely that the company is wasting money as well as the employees' time and efforts. If the budget and plans aren't structured for B2B specifically, they won't move the meter. But there is good news -- there is a corresponding equal amount of potential revenue, growth and prosperity. The leading B2B companies dramatically build their top and bottom lines when leaders realize that success, undeniably and unquestionably, resides with how they engage with the their customers and how that will drive their internal alignment and operations. What is it that they are doing differently than their competition and others in their industry that drive revenue growth, deliver predictable earnings, retain and grow customers and develop new offerings that customers will not only buy, but for which they will pay premiums.